The text of the Periplous or 'circumnavigation' that survives under the name of 'Skylax of Karyanda' is in fact by an unknown author of the 4th century BC. It describes the coasts of the Mediterranean and Black Sea, naming hundreds of towns with geographical features such as rivers, harbours and mountains. But, argues Graham Shipley, it is not the record of a voyage or a navigational handbook for sailors. It is, rather, the first work of Greek theoretical geography, written in Athens at a time of intellectual ferment and intense speculation about the nature and dimensions of the inhabited world. While other scientists were gathering data about natural science and political systems or making rapid advances in philosophy, rhetorical theory, and cosmology, the unknown author collected data about the structure of the lands bordering the seas known to the Greeks, and compiled sailing distances and times along well-frequented routes. His aim was probably nothing less ambitious than to demonstrate the size of the inhabited world of the Greeks. 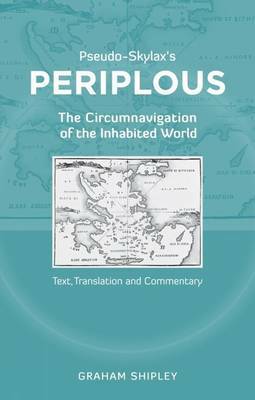 This is the first full edition of the Periplous for over 150 years, and includes a newly revised Greek text and specially produced maps along with the first complete English translation. Interest in ancient geographical writings has never been so strong, yet many of the key texts are inaccessible to those who do not read Greek. With its relatively limited vocabulary and simple, yet varied, syntax, it will provide a useful text for those moving beyond the elementary study of ancient Greek language. "In sum, the author succeeds in presenting a fresh and sympathetic assessment of Pseudo-Skylax's contribution to philosophical geography whilst at the same time making this obscure text more widely accessible. This reviewer threfore has no doubt that the volume will become a standard reference tool for those wishing to study the history, geography and culture of the regions explored in the "Periplous"." --Mark Woolmer "Bryn Mawr Classical Review "